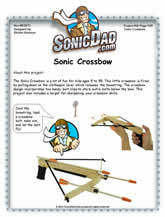 The Sonic Crossbow is a lot of fun for kids ages 5 and up. This little crossbow is fired by pulling down on the clothespin lever which releases the bowstring. The crossbow design incorporates two handy bolt clips to store extra bolts below the bow. 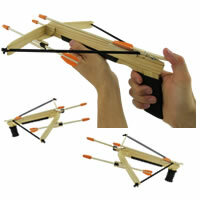 This project also includes a target for sharpening your crossbow skills! Already a member of SonicDad? Login and Download this project for Free! Because kids will remember these projects forever...and so will you. 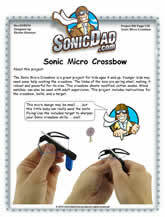 Because SonicDad projects encourage creative thinking and problem solving. Because project instructions give you easy - to - follow guides, templates, and blue prints. Get this project plus 82 additional projects INSTANTLY with your membership purchase! Copyright © 2019	SonicDad Enterprises. All rights reserved.